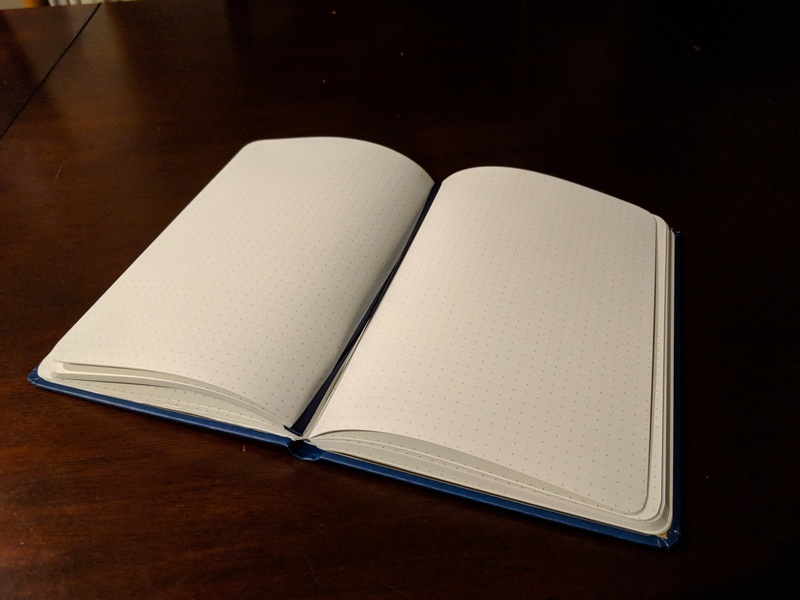 While listening to The Enemy Within, one of the practices they employ that I’ve really enjoyed is the use of the “Player’s Journal”. I suspect the intent here was for the GM to offload some of the podcast production work to the players, and bribe them to do it with XP. The end result strikes me as useful to any game, even if you’re not recording, and as a side benefit when the campaign ends you’re left with a really cool physical artifact. 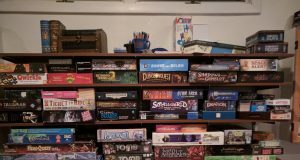 The basic gist is this — one player volunteers each session to keep the journal. 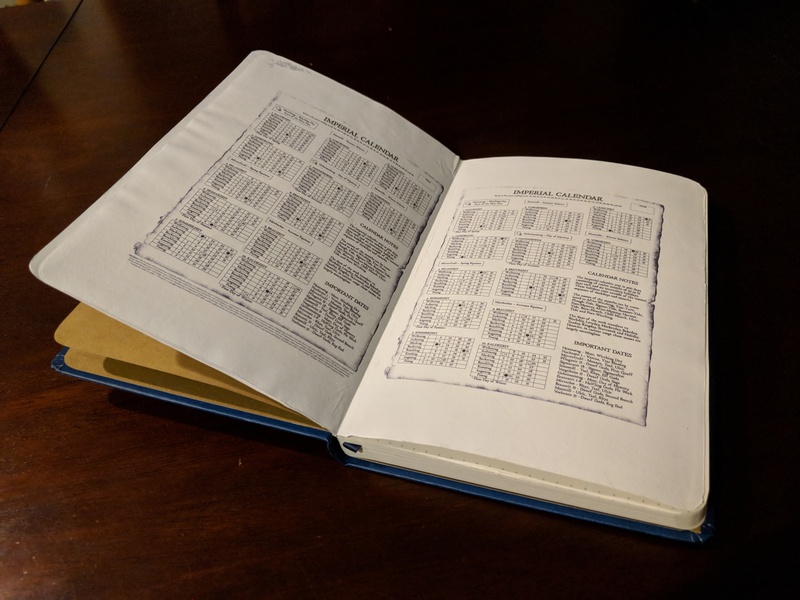 They are required to keep light notes of major events, essentially like 3-5 lines per session, and to update the list of NPCs they meet with names and brief descriptions. The GM uses these notes at the start of the subsequent session to recap the previous, and awards the note-taker 5-20 XP based on how good the notes are. In practice, it seems the players in the podcast see this as a convenient way to gain a few extra XP without it unbalancing the game, and there’s always someone willing to jump in to bump his character over the top to their next advance. At its core this is just a standard blank journal bought at my local Barnes and Noble. They have a lot of designs, and while none of them shouted Warhammer to me, I liked this cosmic design as it is vaguely reminiscent of Sigmar’s twin-tailed comet. 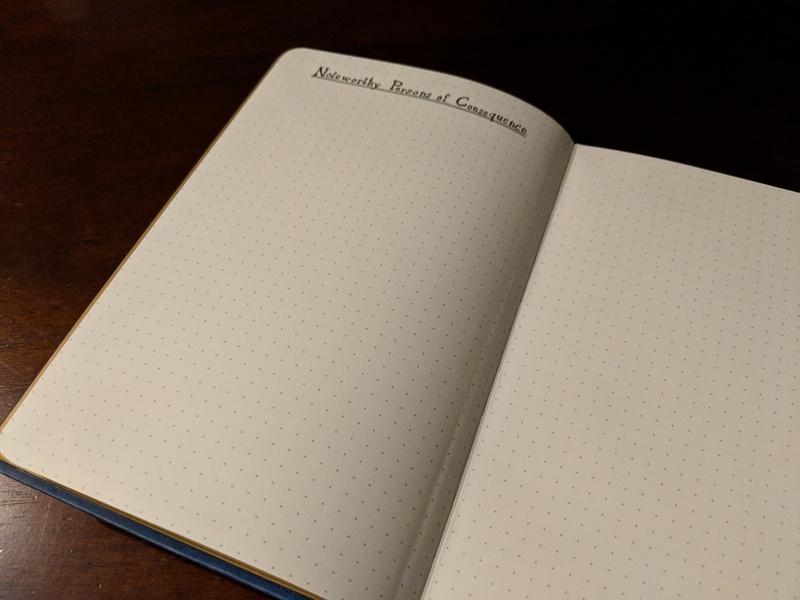 I also liked that the pages were printed not with lines nor a grid, but dots, which I think are nicely unobtrusive and could be used either to write lines of text or draw a quick map. It also has a convenient pocket in the back which I’m sure will be useful for holding the various hand-outs that this campaign will have. Of course I couldn’t leave it at that, so after a little experimenting I printed and cut a few extra fly-leafs to glue into the front. I included the map of the empire from 2nd edition WFRP, which I think looks really good and is at the right level of detail. It gives the overall layout of the Empire to the players but still lets me flesh in details as the they move about. I also dropped in two pages of calendars whose print is a bit small at this scale, but should be reasonable for ticking off boxes and I think two years worth of days should be plenty for the life of this campaign. Finally, I flipped the book over and using the back as the front titled the first page on that end “Noteworthy Persons of Consequence”. 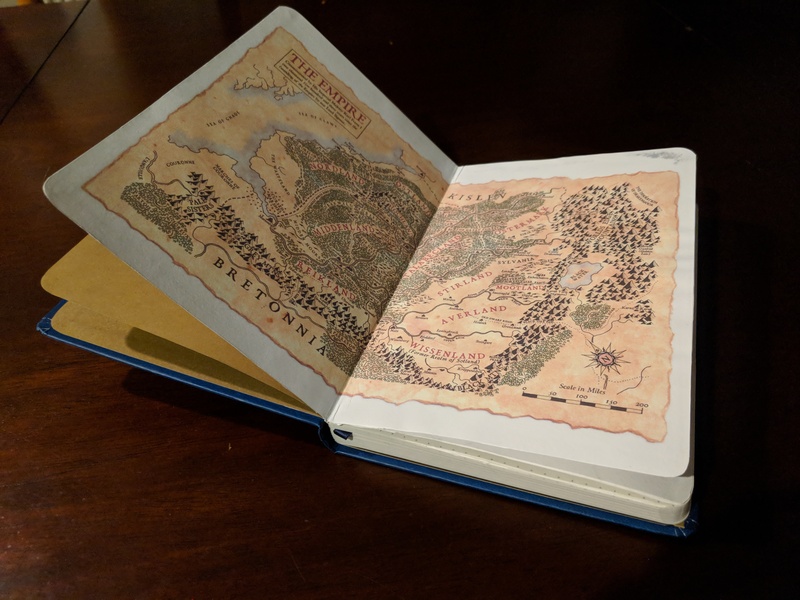 I wanted an obvious place for the players to jot the names of NPCs, and I figured flipping the book over was the best way to keep the notes and the list separate without boxing myself in to a certain number of pages for either. One last rule I’ve instituted that is not from the podcast: you can only write in the journal in pen. Really this rule is just to make the final product at the end of the campaign look more cool. 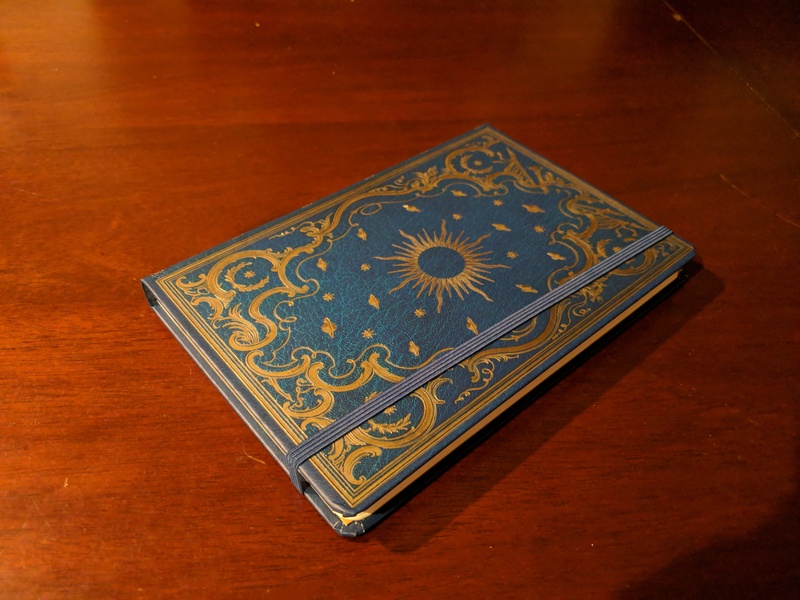 I’m actually kind of hoping that the journal will thus be full of scratching-outs and notes in margins after months of play. I’m also hoping this encourages the players to not feel like they have to make the journal “perfect”, and it will properly reflect the organic evolution of their conjecture rather than having a more edited final snapshot feel. Mechanically I think the journal will be quite useful. I suspect the ritual of reviewing the last session’s events at the start of each session will help quiet everyone down and get everyone’s head in the game. With sessions only happening every other week I think having reminders of what happened last time will be helpful to everyone, myself included. And of course having this all come from the player’s perspective will help ensure I don’t accidentally slip info in there that the players didn’t actually discover. Anyway, that’s the intent. So far we only have one night’s worth of notes in the journal and I have yet to start a session with the recap. I’ll surely post updates as I discover how it plays out.